A RELIC.– We have before us a most interesting relic of the past, surrounded with peculiar importance because of its interest being of a strictly local character. This relic is an old English earthen mug, equal in capacity to a quart measure, bearing upon its outside face, “a map of Cape Fear River and its vicinity from the Frying Pan Shoals to Wilmington; by actual survey.” This mug was given to the late Mr. Junius Davis, of Brunswick County, 10 years ago by one Miss Faulkes, an old maiden lady, whose family had owned it for 70 years previous to that time. There was also in the possession of the Faulkes family another mug, similar in shape and appearance, bearing a map showing the river above Wilmington, which was unfortunately broken. The map on the mug before us seems to have been printed in the same manner in which impressions were made upon crockery ware during the present day. Beginning with the Frying Pan Shoals, the map shows the depth of water thereon varying from 2 1/2 to 9 feet. The depth of New Inlet is laid down as 14 feet, whereas now there is but 11 feet water at high tide. In Guthrie’s channel, recently formed, and known as new New Inlet, there is 12 feet water at high tide during the full moon. The exact date of the survey we cannot definitely ascertain. It must have been subsequent to 1783 as “Cabbage Inlet,” between New Inlet and Masonboro, is laid down as having been filled up during that year. It was prior, however, to the location of Brunswick Court House at Smithville as the county seat is laid down on the map at Lockwood’s Folly, and the name of Smithville does not even appear. Fort Johnson [sic] was authorized to be built by an act of the state legislature, passed April 2d, 1745, and around this work Smithville gradually sprung up. The town by that time could not have reached any pretensions too important. Glancing over the map as it traces the line of the river from its mouth to Wilmington, we notice the site of old Brunswick laid down, from whence our good old town, after its settlement, drew much of its talent, energy and enterprise, as has been stated by a local writer. It was the home of the elder Cornelius Harnett, William Hooper, William Hill, Archibald McLaine, Alexander Lillington, the Quinces, the Eagles, Armand Derosset, Chief Justice Allen, and a host of other accomplished gentlemen and scholars of marked attainments. Kendall, Lilliput, Orton, Old Town and other places of similar familiarity and interest also have their places on this map. On the east side of the river we notice Sugarloaf and Gander Hall, and further across, on the sea face, Stag Park and Masonboro. The owners of this map justly place a very high value upon it. Abounding in historic interest it will be handed down as a valuable relic in the family of the gentleman to whom it was presented by the descendent of its original owner. Above image courtesy of the NC State Archives, Raleigh. For a high resolution image of the copy held by Harvard University, click here. Curiously, the Price & Strother map of Cape Fear does show Smithville. Also, the title of the map includes credit to Price & Strother. One would think the writer would have acknowledged these facts if the Price & Strother map was used. Another article five years later sheds more light, or perhaps adds more confusion. interest, including Old Brunswick, are to be seen on this map. The mug is the property of a lady in this city, but will be deposited in the museum at the Library. A similar vessel with a map of the river between Wilmington and Fayetteville, was formerly in the possession of the same lady, but, unfortunately, was not long since destroyed. Who was this Potts fellow? Joshua Potts (c1751-1825) was a leading merchant of Wilmington and a founder of the town of Smithville (now Southport). He had Price & Strother’s map re-engraved to a much smaller size. 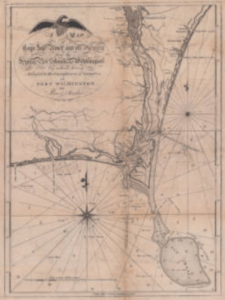 In a letter to Governor William Hawkins, Potts wrote, “When in Mercantile Business, I had many of them struck which I used to send with Wilmington Prices, to Correspondents at distant and Foreign Ports.”1 In other words, he used his smaller Cape Fear map as an oversized business card. This would have been a much more manageable size for transfer onto a quart-size mug. Potts’s map, shown below, measures 7 7/8 x 5 5/8 inches, compared to dimensions of 18 3/4 x 13 7/8 inches for Price & Strother’s map. So, Potts’s map was used? Not so fast. The 1868 article reported the map title as “…by actual survey.” Although that was part of the title of Price & Strother’s map, Potts omitted that phrase from the title of his map. The 1868 article also gives a sounding of 14 feet at New Inlet, matching the Price & Strother map (Potts’s map gives a sounding of 11 feet). Perhaps neither map was used directly. Given the lack of a perfect match to either map, one must consider the possibility that the creator of the mug had an entirely new “hybrid” map created for use on the mug. Unfortunately, no image of the mug has been located, and it is currently unknown if the mug still survives. Do you have information about this mug? Please share using the “What’s on your mind?” box below. articles, which he offers at wholesale prices, viz. Winterthur Portfolio, Volume 15, No. 2 (Summer, 1980) contains an excellent essay, Transfer-Printed Creamware and Pearlware for the American Market, by Christina H. Nelson. An article focusing on transfer-printed creamware custom made for North Carolinians was written by Brad Rauschenberg; “‘Success to the Tuley’ et. al. via Liverpool” was published in Volume 2, No. 1 (May, 1776) issue of the Journal of Early Southern Decorative Arts. Joshua Potts to William Hawkins, August 28, 1813, William Hawkins, Governors Papers, State Archives, Division of Archives and History, Raleigh. 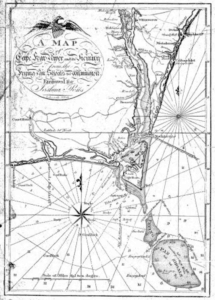 This entry was posted in 19th Century, Cartifacts and tagged cape fear, John Strother, Jonathan Price, Joshua Potts, Price-Strother by crmaps. Bookmark the permalink.